Thomas Wensel wants to install Windows 7 while keeping his older version. This is a great idea if you have enough spare hard drive space. It allows you to move to the new OS without burning your bridges. And it's surprisingly easy to do. In fact, the hardest part is shrinking the existing hard drive partition to make room for a new one, and that's still pretty easy. Before you begin, make an image backup of your hard drive. This is a must before resizing a partition or upgrading Windows, so it's a double must if you're doing both. I recommend the free version of Macrium Reflect for image backup, although other programs will do. You'll need an external hard drive at least as large as the used space on your drive. Backed up? Good. Let's get on to the partitioning. I've yet to find the perfect partitioning program--one that's easy, reliable, versatile, non-destructive (meaning it can resize a partition without erasing it), and free. So I'm going to recommend three, all non-destructive, and tell you about their shortcomings. what to do. But the free Home Edition doesn't support 64-bit versions of Windows. So if you live in the x64 world, you'll have to shell out $40 (on sale as I write this for $32) for the Professional version or use another program. 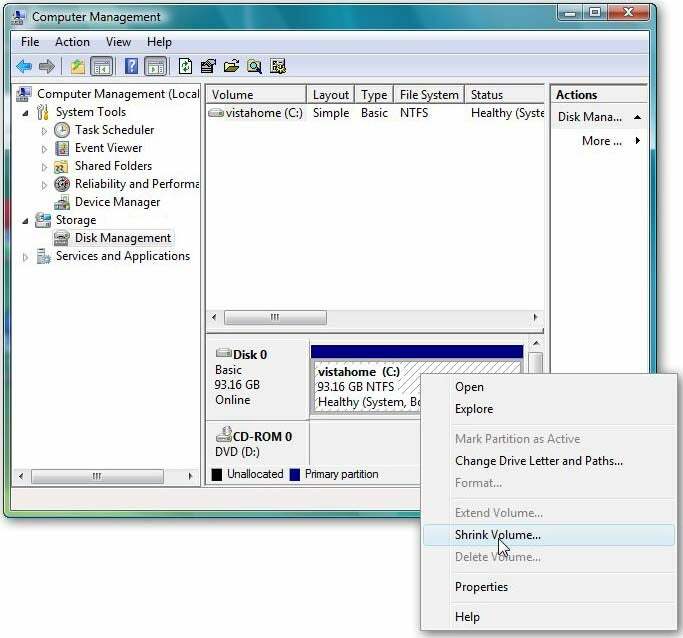 Vista 's Computer Management program: Windows Vista has it's own tool for resizing partitions. To access it, click Start, right-click Computer, and select Manage. Click Disk Management in the left pane, under Storage. Right-click your C: drive in the resulting map and select Shrink Volume. You can figure out the rest. But this program may not let you shrink the partition as much as you would like--it has some strange ideas about how much space your current partition needs. And it's not an option if you're using XP. GParted Live: You can download this free, open-source Linux program as an .iso file, which you then burn to a CD. (Don't just copy the file to a disc. If double-clicking the .iso file doesn't launch a disc-burning program, download and install the free ISO Recorder.) When you boot from that CD, Linux and GParted Live will load, and you'll be able to resize your partition. But this program isn't easy. Depending on your video setup, the font may be so small it's virtually unreadable, and it's hard to know when it's done altering your drive. Whatever program you use, I recommend you shrink your existing XP or Vista partition by at least 40GB. That will leave more than enough room for Windows 7. You don't need to create a partition--the installation program will do that for you. When the partitioning is done, boot from the Windows 7 DVD and start the installation process. When it asks what type of installation you want, select Custom (Advanced). When it asks "Where do you want to install Windows?" select the Unallocated Space. See How to Upgrade to Windows 7 for more information. The install program automatically sets up a dual-boot system. When you boot, it will ask you which version of Windows you want to load. Whichever you pick, the other partition will be visible as another drive, so you'll be able to access all of your files in both versions of Windows. Added, 11/30/09: At some point in the future, assuming you like Windows 7, you'll want to remove the old partition and the dual-boot prompt. To begin that process, see Remove a Windows 7 Dual Boot, Part I.